Last night The Genuine Hospitality Group participated Miami’s inaugural Taste of Tennis event to kick off the Miami Open, the annual two weeks of tennis mania on Key Biscayne from March 23-April 5. With an invite from chef Kerry Heffernan, we brought our e-game to the W South Beach, offering a taste of ella, Michael’s pop-up café coming to the Design District’s Palm Court in April. Keeping it simple is one of the keys to what makes Chef’s food so good, and he even offers a “Basics” section in his cookbook dedicated to just that. 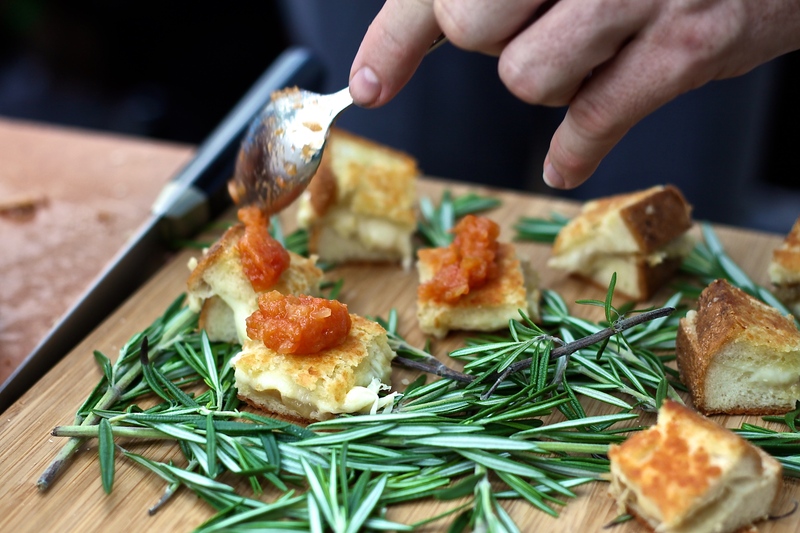 Tomato jam is one of those versatile pantry staples from which many dishes can be built… like ella’s Parmigiano-Crusted Grilled Cheese. Special Ops Chef Thomas Tennant griddled and perfectly pressed 40 cut into bite-sized pieces of love for a sporty and suited crowd that couldn’t get enough! Thomas is a former USTA player and tennis coach who knows his way around the tournament, having been a ball boy for as many years as it has title sponsors. Lipton, Sony Ericsson, Nasdaq… and now the Miami Open! Great call Itaú on finally giving the city its naming rights. It was great to put a face to a pug and meet Geoffrey Anderson of Miami Food Pug and to have some professional sous chefs stop by! Kerry, an avid fisherman, put out an incredible crudo, and we were surprised to see a lionfish at his station. Thomas is passionate about eliminating this invasive species in the Cayman Islands through cooking, and apparently there is a population in the Florida Keys ripe for the culling. The sandwich combines buttered slices of hearty pullman loaves coated in Parmigiano that gets a crispy, flaky crust on the griddle before its stuffing of gruyere, fontina, and caramelized onions melt together with a warm hug from our Breville panini machine. 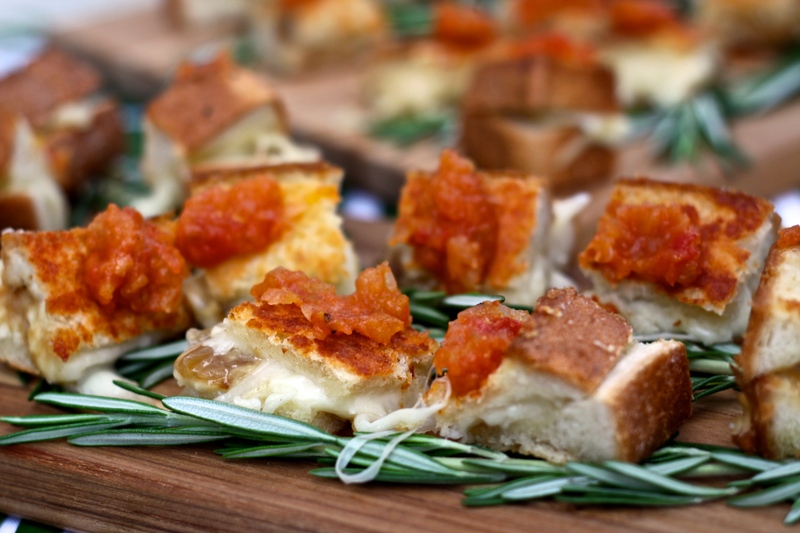 The tomato jam is the bright, sweet finish to tie it all together. Bring a pot of water to a boil and prepare an ice bath. Cut a little cross mark on the bottom of the tomatoes. Immerse the tomatoes in the boiling water for about 15 to 30 seconds, until the skin starts to peel away. Using a slotted spoon, remove the tomatoes from the pot and transfer to the ice bath to cool quickly and stop the cooking process. Peel the tomato either with your hands or with a paring knife. Cut the tomatoes in half and squeeze out the seeds. Coarsely chop the tomatoes and set aside. You should have about 3 1/2 cups. Place a large skillet over medium heat and coat with the oil. When the oil gets hazy, add the onions. Cook and stir until the onions soften slightly and get a little bit of color and, about 6 minutes. Add the tomatoes, cloves, and season with salt and pepper. Cook and stir until the tomatoes start to break down and release their liquid, about 10 minutes. Add the vinegar and agave. Continue to cook, stirring often to prevent burning, until the liquid has evaporated and the chutney is thick, about 5 minutes. Cool to room temperature and pulse a few times in a food processor. Keeps sealed in a refrigerator for a week, longer if properly canned.